Sober Look: China's export figures: fudging or currency trading? China's export figures: fudging or currency trading? Little doubt remains that China's export numbers are at best unreliable but more likely simply fudged. MarketWatch: - While it’s unavoidable that any official data from China comes under criticism from the skeptics, the monthly Chinese trade data probably draws the most questions and head-shaking of them all. The Customs, rather than the National Bureau of Statistics that produces most of China’s other high-profile economic numbers – can sometimes show striking contrasts with other data sets. For instance, Tuesday’s Customs data showed exports surging 14.7%, well above a Dow Jones Newswires forecast for a 8.6% gain and prompting a swing in the trade account to an $18.16 billion surplus, compared to March’s $884 million deficit. This paints a very different picture from data on manufacturing (which makes up the lion’s share of Chinese exports) as reported by HSBC and Markit. The HSBC manufacturing Purchasing Managers’ Index, probably the most watched non-government data on China, showed new export orders shrinking in April, the first time they’ve dropped since December. A relatively straight forward way to determine the reliability of any export measures is to compare them with the imports reported by the trading partner nations. And that's where things don't match up for China. 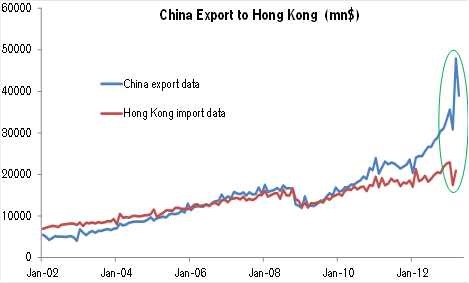 CS: - Since July 2012, China’s exports grew by roughly $15bn, but only $5bn showed up in its trading partners data. The discrepancies can be found in several regions, but especially Hong Kong. The reported numbers for Hong Kong for example diverge dramatically. But who exactly is fudging the numbers and why? The typical answer one hears in the media and from the blogs is that China's government is doing this as a form of propaganda or to please the party leadership. But to assume that the government is willing to cook these figures intentionally, given the tremendous global scrutiny, would be naive. The distortions are actually driven by the exporters themselves. China's exports are flagging and those involved in moving merchandise abroad have found an alternative way to make money. As the chart below shows, the yuan has been steadily appreciating (the chart shows the dollar depreciating against CNY). China's government allows exporters to buy yuan and sell dollars in order to convert their export proceeds back to domestic currency. But by exaggerating their exports (which are reported to understaffed and bureaucratic customs officials - and not the National Bureau of Statistics ) these firms are allowed to buy larger amounts of CNY than they need - effectively taking a bet on the currency. The more they claim they exported the more CNY they can buy. As CNY appreciates, they make money. Normally China would not allow currency speculation, but these folks have found a loophole that lets them go long CNY against USD. The unintended consequence of the FX speculation is a bloated national export number. CS: - ...the July 2012 liberalization of trade and foreign currency receipt regulations for mainland exporters... has created incentives for exporters to profit from Yuan appreciation by over-reporting trade flows or shifting inventory offshore. The RMB has appreciated significantly over this period.